Horse Drawn Carriage Service for Weddings, Parades, Parties and other Special Events. We can customize our service to fit your special day. From surprises to grand entrances, we will enchant your guests. We service Wisconsin and northern Illinois. We are not licensed for the City of Chicago, please do not ask for a quote if your event is in Chicago. 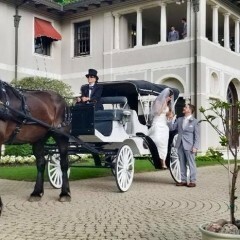 The carriage ride was a perfect touch to a romantic wedding ceremony in the park. Just beautiful! Thank you Kathy for your kind words. We strive to create memories that will last a lifetime. The people at The Enchanted Carriage are wonderful. I was in my carriage and forgot my bouquet, they ran to find it and encouraged me about the worrisome weather on my day. They suggested we have some time after our ceremony to just ride around and it truly was a wonderful pause for us. I would highly recommend!! Debi was very nice and helpful. The carriage is beautiful! I did feel bad for the horse, as our parade is quite big and it seemed to be a bit overwhelming for the horse, but Debi kept her calm. Thank you very much! If you have never been to the Monroe Cheese Festival, you need to add it to your list. Great food, cheese tasting and music. The parade route is two miles long and units were still leaving the fair grounds when we finished the route. The cows wearing swiss bells were beautiful but a bit too much for my horse. I am sure he has now lost his fear of loud marching bands after watching several practice and line up for their part in the parade. The parade was a lot of fun and we are glad we were able to take part in it. What can I say except Lori knows how to throw the perfect Birthday Party. Beautiful park, perfect weather, great guests. We had a wonderful time performing at this event. Top notch service. Clean and roomy carriage with a handsome steed and polished harness. Our service is tailor made to your needs and desires. Enchanting Brides since 1997. Make your special day one to remember. Let The Enchanted Carriage create a memory that will last a lifetime. Experience the Enchantment. Nothing very technical here, have road will travel. We provide service at your location. All we need is a place to park the truck and trailer and of course a place to park the horse and carriage before we pick you up.